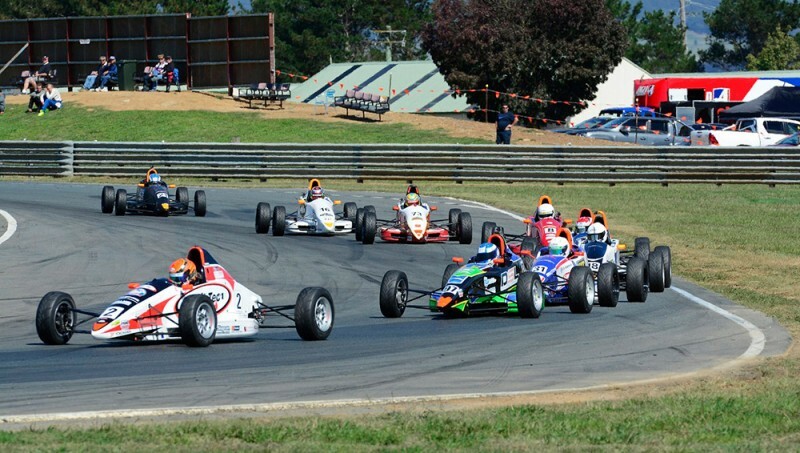 This weekend’s CAMS NSW Motor Racing Championship race meeting at Wakefield Park has attracted some of the best-credentialled drivers ever seen for a state-level event at the Goulburn circuit. Commentator Lachlan Mansell runs his eye over the form guide. It might be branded as a state-level event, but this weekend’s CAMS NSW Championship round at Wakefield Park has the vibe of something a lot bigger. For a start, there are two national categories on the program: Formula Ford and Sports Sedans. But the remaining series have also attracted an extremely high calibre of drivers – in fact, every class will be contested by at least one driver with recent national-level experience. The second-longest running Australian championship continues to cement its reputation as the undisputed breeding ground for future stars – while Jason Bright has retired from full-time competition, the addition of Jack Le Brocq and Anton De Pasquale to the field means there are a total of 11 Australian FFord Champions on the 2018 Virgin Australia Supercars Championship grid. This weekend marks the third round of the 2018 Australian FFord Championship, and Sonic Motor Racing Services drivers Hunter McElrea and Hamish Ribarits are tied at the top of the standings. McElrea dominated the season opener at Winton, but Ribarits was victorious in Round 2 at Queensland Raceway. Liam McLellan is third in the points ahead of privateer Zac Soutar, who picked up his maiden national podium at QR. Coming into 2018, BF Racing driver Cameron Shields was expected to be a championship contender after his storming finish to last year’s series, in which he won eight of the last nine races. But Shields has had a quiet start to this year’s season, and needs to fire soon to keep his chances alive – he is already 49 points off the series lead. Another driver to watch will be Lachlan Mineeff – he has done more laps at Wakefield Park than most drivers in the field, and he also happens to be mentored by the most successful national FFord driver at the venue: Cameron Hill, who won all three races on his way to the 2015 national title. This weekend doubles as the second round of the NSW Formula Ford Championship, which means promising talents such as Tom Sargent, Cody Burcher and Nicholas Padjen will have the chance to test themselves against the national front-runners. The return of national Sports Sedans to Wakefield Park brings out arguably the most successful car in Australian motorsport history. The famous red Alfa Romeo GTV has been driven by Tony Ricciardello to a staggering 10 Australian Sports Sedan titles; the West Australian may have skipped last season, but he returned in style at Tailem Bend’s 2018 season opener, where he won the round. Ricciardello’s closest challenger at The Bend was Steven Tamasi, however there were a couple of other drivers – notably Walkinshaw Andretti United Supercars endurance driver Jack Perkins and Tickford Dunlop Super2 racer Thomas Randle – who showed winning pace only to be denied results due to mechanical problems. And if you thought Randle was just doing the Sports Sedans for a bit of fun on the side, think again; he travelled all the way to Wakefield to test his Saab 9-3 last week. Also looking for a strong showing will be defending champion Birol Cetin, who languishes 16th on the points table after a lacklustre opening round and will be hoping his familiarity with Wakefield Park is an advantage. The likes of Nathan Gotch and Shane Wilson should feature at the front of the field in their late-model Dallara Formula 3 cars, but the big news this weekend is the addition to the field of Richard “Spike” Goddard, in an F308 Dallara. Goddard formerly competed in the British and European Formula 3 Championships, Porsche Supercup and even tested a Force India Formula 1 car in 2014. A healthy 23-car field is entered for the second round of the 2018 NSW Championship and it’s reigning two-time national champ Brett Osborn who is the firm favourite; brothers Chris and Jason Molle will likely be his main challengers. As has become tradition, the field will be spilt into two grids for Under and Over 2 Litre cars this weekend. Following his sensational Wakefield 300 victory (alongside his father John) in February, Trevan Spiteri returns to Wakefield Park in his Mitsubishi Evo and has every chance of scoring more race wins in the Over 2 Litre division, while the Honda Civics of Bob Jowett and Mike Fitzgerald will do battle with the Integra of Harrison Cooper and Nissan Silvia of Kurt Macready in the Under 2 Litre races. This category plays host to a high-quality field of cars and some big-name drivers. Australian GT Championship competitor Daniel Gaunt will race an Audi R8 LMS, while Lisa Montgomerie will share a Ford Focus MARC car with Daniel Jilesen – Montgomerie is also cross-entered in Sports Sedans. Also on the entry list are 2014 Wakefield 300 winner Andrew Macpherson (Porsche GT3-R) and 2013 Winton 300 winner Nick Cancian (Mazda MX5 Turbo). They may have raced just a fortnight ago at Sandown, but that hasn’t stopped a solid contingent of production cars making the trip to Wakefield Park. Driving his supercharged VF HSV GTS, Tony Virag will be hard to beat in Class A1 (Extreme Performance Forced Induction); his main opposition could well come from Clay Skinner in his Mitsubishi Evo X. In Class A2 (Extreme Performance Naturally Aspirated), Mark Caine will be looking to build on his strong run at Sandown while the lower classes also feature some talented drivers, such as Josh Muggleton and Toyota 86 Series runner Zach Loscialpo. Another category to welcome drivers with national-level experience, SuperSports will be contested by a collection of Radicals (including Mitchell Neilson) and the Stohr of Darren Barlow.